I was playing Agog in the editor’s listening room when his wife happened by. Lee had recently begun a series of color-field abstractions. Her response to the music knocked me for a loop. She heard Agog as the sonic complement to the paintings then in progress. What seemed to Lee a strong correspondence escaped me entirely – another facet to music’s mysteries. Innovative art does not grow within vacuums. Rammel’s creations call antecedents to mind, albeit at a healthy distance. One thinks first of Harry Partch’s instrumental concoctions, along with traces of gamelan gong and, with respect to speed, Conlon Nancarrow’s player-piano romps. No less significant with respect to impact is Rammel’s care for good sound. Agog exceeds an audiophile’s requirements though perhaps not his needs: Little depresses quite so much as your garden-variety sound-geek’s musical tastes, but that’s another, best unsaid story. We’re here to celebrate success. 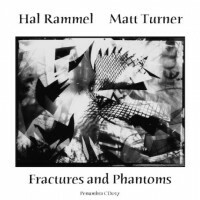 Penumbra CD017, Fractures and Phantoms, has Rammel at work with cellist Matt Turner. As much as I enjoy this collaboration, its appeal is to a narrower base. 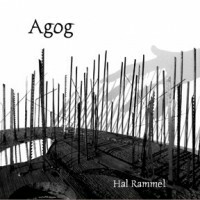 Agog is luscious. I rather suspect that Fractures and Phantoms – emphasis on fractures – would incite luthiers to murder. In a number of places you’d be hard put to identify the instrument with which Turner cobbles his sounds. And the astonishments continue. 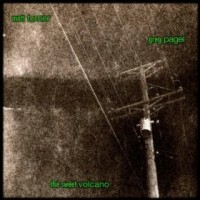 The Sweet Volcano, Icker Records IR001, has Turner performing richly euphonious improvisations with pianist Greg Pagel, several of which call late-Romantic duos to mind. Be that as it may, both gents can produce straightforward music up there with the best. A few of the disc’s tracks would appear to belie the statement that “[a]ll selections are improvised with no editing.” Others, on the wilder side, tend to confirm. 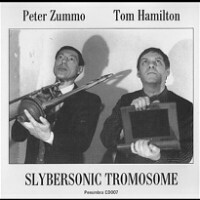 We leave Penumbra to its fruitful devices with an early release (CD007, issued in 2000), Slybersonic Tromosome, with Peter Zummo, trombone, and Tom Hamilton, electronics. I’ve long admired Hamilton’s sophisticated manipulations. In this improvisational match-up, Hamilton’s unhurried delights operate as the perfect foil to Zummo’s mellow brass. These gents kill with kindness. They’ve performed together often, and it shows. Again, really good sound. 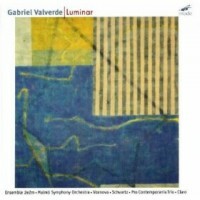 Luminar features the music of Argentine composer Gabriel Valverde (mode 94, issued in 2001 and still available). The opening work, Espacios Inasibles, for large orchestra (Malmö Symphony, Arvo Volmer conducting), amply demonstrates Valverde’s mastery of al niente, dal niente – into and out of nothingness. The instrumentation’s beautifully recorded intricacy cannot fail to engage. My personal favorite, Terra Incognita, for string trio and tape, take into and out of nothingness on an understated journey that delights from start to finish. No part of this disc disappoints.